Chicagoans and radio fans everywhere are mourning the loss of radio personality Herb Kent, who passed away Saturday evening at the age of 88. His death marks the end of an long career – 72 years working in radio, a Guinness World Record. Most recently, he was handling daytime weekend shifts for iHeart Media powerhouse WVAZ-FM, known as V103. His last day on the air was Saturday. Kent was known on the air as “The Mayor of Bronzeville” and “The Cool Gent”, referencing his calm and cool demeanor on the air. His knowledge of R&B music was second to none. His popularity endured many changes in the radio business and in the music industry. Kent began his long radio career in 1944 working for a variety of Chicago radio stations, including WJJD, WBEZ, WMAQ, among others. His first paid job was at WGRY in Gary, Indiana. But his rise to fame came in the 1960’s, where Kent was known as one of “The Good Guys”, on WVON-AM. During his time at WVON, Kent was involved in the Civil Rights Movement, hosting luminaries such as Dr. Martin Luther King Jr., who appeared on the station during what would turn out to be his final trip to Chicago. In his later years, Kent continued his activism, urging Chicago’s youth to stay out of gangs and stay in school. Kent landed at WVAZ when the station launched in 1988, replacing WBMX-FM. His television work was short, but notable – Kent hosted a short-lived dance/stepping show titled Steppin’ At Club Seven for WLS-TV in the mid-1990’s. Reruns of the show later popped up on Chicagoland Cable TV (Channel 25 on Comcast systems.) Kent was also a pitchman for the now-defunct Seaway Furniture, located at 89th and Stony Island in Chicago’s Calumet Heights neighborhood. Outside of media, Kent was an instructor at Chicago State University, his alma mater. The list of honors for Kent is long. He became the first African-American to be inducted into the National Radio Hall Of Fame in 1995, and was inducted into the National Rhythm & Blues Hall Of Fame a few months ago. Kent was honored several times by the City of Chicago and Illinois, with a street in Woodlawn named after him (a section of Stony Island between 63rd and 65th with the honorary designation of “Herb Kent Way”). 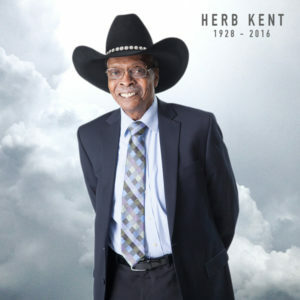 Herb Kent passed away on Saturday evening. No words can express our great sense of loss. Herb was an iconic talent, who for nearly 70 years entertained millions of listeners in Chicagoland and around the world. His passion for radio and work ethic was second-to-none as Herb worked to the very end, by hosting what unexpectedly was his final V103 broadcast on Saturday morning. Herb leaves a legacy of thousands of entertainers he helped boost, community causes he impacted, and as a former instructor at Chicago State University, sharing his encyclopedic knowledge with hundreds of students. We are so thankful for the privilege of working alongside such an historic figure as Herb Kent for the past 27 years. Our thoughts and prayers are with Herb’s family, friends, and loved ones. In an era where radio is filled with a lot of “bad guys” on and off the air (if you’ve read this site for the last decade, you know what I’m talking about), Herb Kent was indeed one of the “good guys”. Kent cared and connected with his audience – which explains why he was so durable. He knew about the music he played, too – telling stories that would engage his listeners for hours. This is why his weekend shows on V103 was must-listen radio. While yours truly did call Chicago radio the worst a while back, people like Herb Kent is a reminder why Chicago radio is also a gem. A legend in his own right, Herb Kent was a class act – beginning to end. Rest in peace, Cool Gent. It is truly a sad day! Herb was a mentor for me starting my career as a club dj. We were discussing me having an interview to discuss the good old days at the Markham roller rink the guys and Gals club.69th and Peoria. RIP>> Herb Love you man dj Charlie P.